As part of the Klingenstein Heads Programme I visited four schools here in New York and conducted a review of relevant literature. As a result there are three broad areas of recommendations when considering how 21st century schools best prepare students to be successful in our digital age. These will be considered as areas of thought and be described below. Many schools in developed countries have been swamped with new technologies. One to One laptop programs are increasingly common in schools, interactive whiteboards are present in many classrooms and in recent years students have increased access to mobile digital devices. However it would be shortsighted to reach the conclusion that filling schools with digital and information technologies will automatically prepare young people for the digital age. In the same sense, giving teachers increased access to digital technologies without providing training and without clarifying what schools are trying to accomplish is a recipe for disappointment and unmet expectations. In the early stages of digital technologies in schools it was expected that in most cases a specialist teacher would meet student needs through explicit computer classes. However, there has been a shift away from a standalone approach to one of integration. As educators consider how best to prepare students for the 21st century we must reflect upon what we want and why this is important for education. The first broad area of recommendations is to know the what and the why. What digital competencies are important for students to develop and why are these important? Digital competencies are a set of skills, knowledge and attitudes applicable to the use of digital technologies and media that are critical for learning, work and wider life. There are different ways that those with responsibility for curriculum design might wish to approach the development of a scope and sequence of key digital competencies. For example they may wish to involve representatives from external organisations, review literature and research, and dialogue with students. It is recommended that the outcome should be a clear articulation of digital competencies. The second recommendation is figuring out how students can develop these competencies. What are the best and most enriching learning experiences available and what resources might be needed and available within a particular context? A key point to highlight here is that digital technologies become the vehicle that gives students the opportunity to develop one or more competencies. For example where the aim might be for students to develop collaborative skills then online applications such as Skype, Google hangout or FaceTime might be utilised to learn with students from different parts of the world. The third recommendation relates to how teachers can best be prepared to facilitate the learning of different digital competencies. First, schools must commit to continuously developing teachers so that they are able to role model and teach the different competencies using digital technologies. Teachers must be committed to learning since the growth and influence of technology and digital media is exponential. To know the success of any technology integration program schools should consider how best to assess and track student progress. 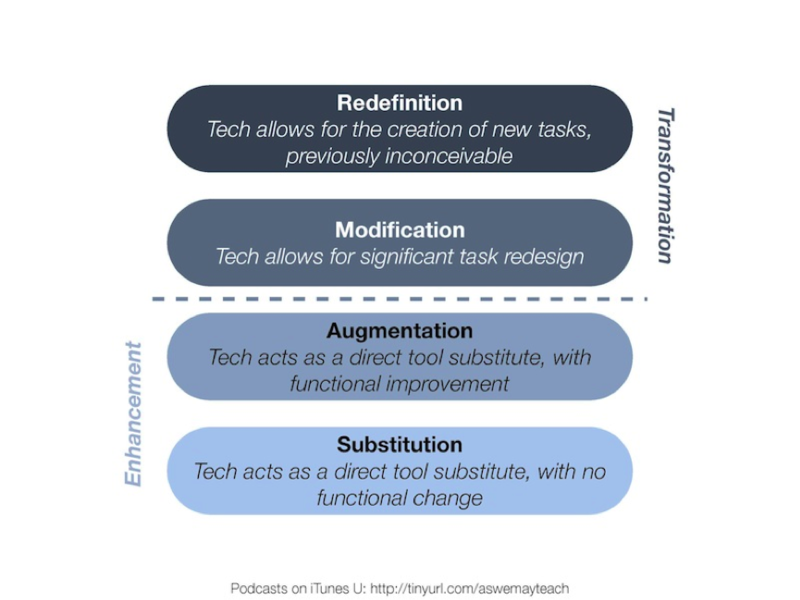 Additionally schools might wish to apply the SAMR model to evaluate how technologies are being used by teachers, share practices and identify development needs. Hi Simon, thank you for the article! I agree with everything that you are saying here and I think this is a great guide for teachers starting to incorporate technologies in their lessons. However, I would like to make some additional comment, if I may. You talk about using technologies for developing digital competencies (DC), which is the end goal. As teacher I was always aiming to use technologies in order to achieve other goals more efficiently, the simplest example is making power point presentation where the goal is developing presentation skills and summarizing information. Of course, the students needed the digital competences in order to complete the task well, but that wasn’t the main goal. Then we worked separately on DC and with the previous experience the students improved faster. I believe this to be more efficient method in order to achieve overall more and better results. This ideas are also incorporated in the software I’m working on, where students “absorb” information kinetically and the DC are just a side effect. Please, take 2 minutes to look at this video: http://youtu.be/Gy8VnBx7eqA and maybe the website if you find it interested. About 200 schools are using it and every one of them reports increase in results and students motivation and I believe it to be the next step in Ed-tech. I’ll be happy if you share your views on the topic!